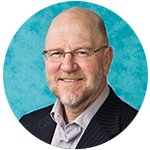 This article, written by Mal Walker, Manager at Logistics Bureau, in the March/April 2019 issue of MHD Supply Chain Solutions. What robots are available and should you use them in your DC? Don’t worry, contrary to the terrifying Daleks portrayed in the long-running Dr Who series, robots are not taking over the world or the universe! In reality, they are more analogous to the friendly droids of Star Wars’ 3-CPO R2-D2 and BB8, who are loyal and faithful servants to their human and non-human masters. This is good news for distribution centre operators, because the Star Wars ‘droids’ have morphed into a new generation of reliable DC robots that are revolutionising the logistics world! Research from market intelligence firm Tractica reports that the worldwide sales of warehousing and logistics robots reached USD1.9 billion in 2016, with growth in coming years its projected to reach USD22.4 billion by the end of 2021. Manufacturers of robots can therefore expect unit shipments to increase from 40,000 in 2016, to 620,000 units annually by 2021 (reference: www.tractica.com). But who is buying robots? Traditionally, it was manufacturers with repetitive production processes, but the robotic landscape has broadened to include distribution centres, mines, hospitals, hotels, casinos, offices, mines and others. In fact, any application where a process can be automated. SHOULD YOU USE THEM IN YOUR DC? In this article, I will briefly touch on the 13 most common types of robots that are being used in distribution centres, along with their characteristics and uses. This is by no means a comprehensive list, but it may help in working out what robots could be beneficial in your situation. Firstly, how do you classify robots? Particularly as there are so many variants. The Tractica report lists the following four in the context of distribution centres. Mobile robot platforms: automated guided vehicles (AGV) and autonomous vehicles. Shuttle automated storage and retrieval systems: ASRS, featuring in-rack robots. Industrial robotic manipulators: typical robotic arms that can be applied to countless applications. Gantry robots: robots that run on overhead structures. But what do they do, and how do you know if you would benefit from one, or more? 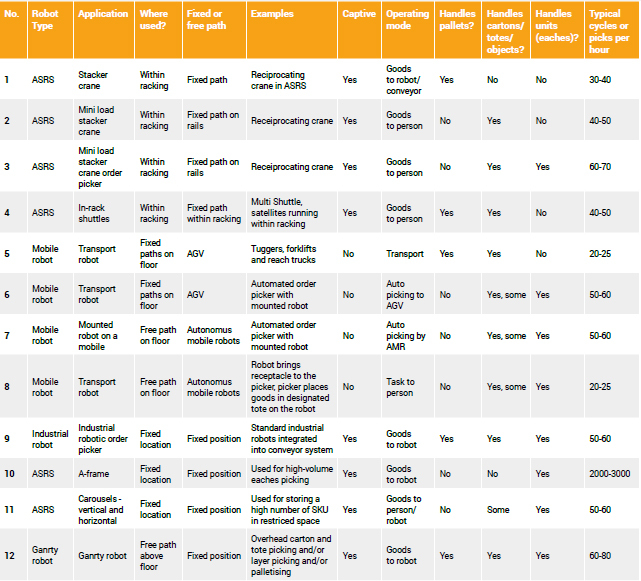 To assist, I’ve developed a table that lists the types of robots and applications in warehousing facilities. Bur first here are some definitions. AGV: Generally used for transport of goods within a set path or circuit. May be guided by rails, lasers and sensors. These have been around for many years, but AGV technology has advanced and is far more affordable, reliable and applicable to many types of mobile equipment. Shuttle systems: Used within racking systems to place and retrieve stock. The racking maybe serviced by automatic conveyors or AGV, or manually by an operator. Autonomous mobile robots: These are free-path robots controlled to operate on the best put-away or picking path. Using sensors and cameras, they can navigate around a DC where people are working. They are ideal for goods-to-person and task-to-person applications. Stacker cranes are used in automated storage and retrieval systems for pallet handling. Yes, they have been around for many years, but they are a robot, nonetheless. They typically run on fixed-path rails systems. Mini-load stacker cranes: Related to the larger stacker cranes, mini-load cranes run on fixed rails installed within racking. They can achieve high rates of replenishment and picking and are now able to pick cartons, object and eaches to totes or conveyor belts. Industrial robotic order picker: Using conventional robots with articulated arms for picking and palletising/ depalletizing etc. has become common place. In recent years, visualisation technology has enabled robots to see and pick stock in units. If the robot does not have the right gripping device to pick items up, it merely changes to the right one, and continues picking. Goods-to-person: Where a robot brings goods to a human for order picking purposes. Task-to-person: Where a robot brings a receptacle and picking intelligence/ information to a picker, so that the picker can pick the required goods to specific order bins on the receptacle. (Amazon makes use of task-to-person robots in some locations. Person to robot: A person brings goods to a robot for specific orders or sortation and delivery by the robot to a consolidation or packing zone. These robots can typically include tilt-tray devices for feeding goods into staging bays or directly to cartons. Now that you know the common types of robots and operating modes, the charts should make some sense in terms of application. What is hard to define is the cost for automation and robotics. This is complex and depends on many factors too numerous to cover here. However, the evidence suggests that robots are becoming cheaper, reliable and easier to justify than ever before. If you are looking at robots as a solution, be sure to do your homework in terms of analysis, application, and return. The 12 most common robots in distribution centres.